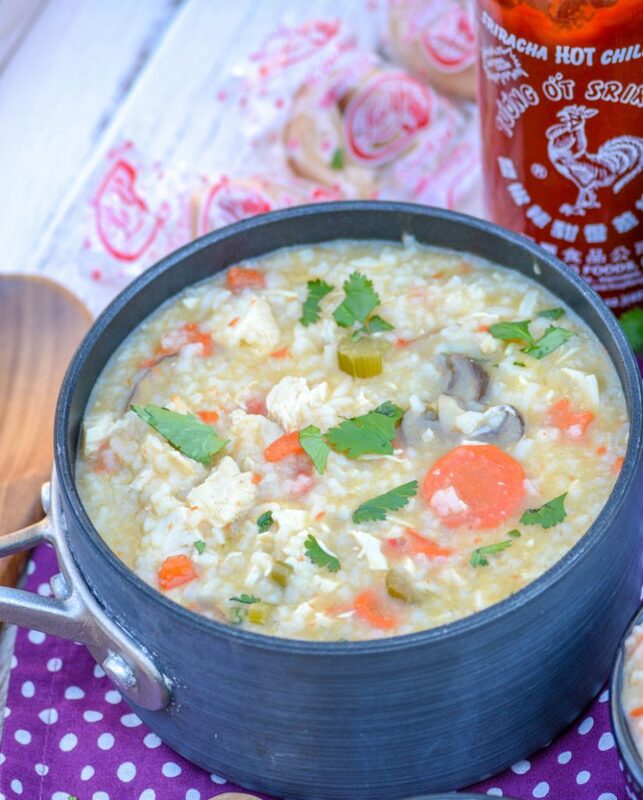 We all have at least one version of chicken & rice soup we enjoy. 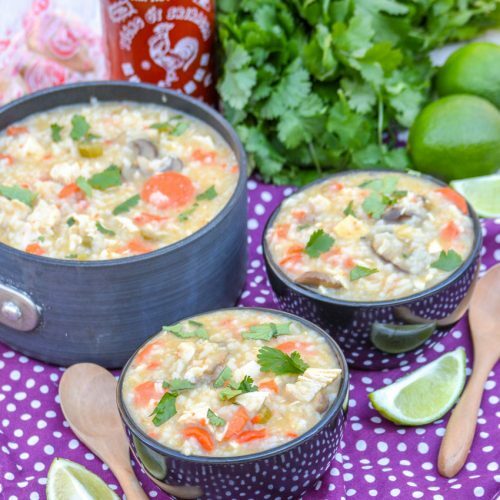 This Thai chicken coconut soup version ups the ante by adding Thai flavors and giving it an Asian flair. It’s hearty, with just the right amount of subtle sweet & savory flavor notes. 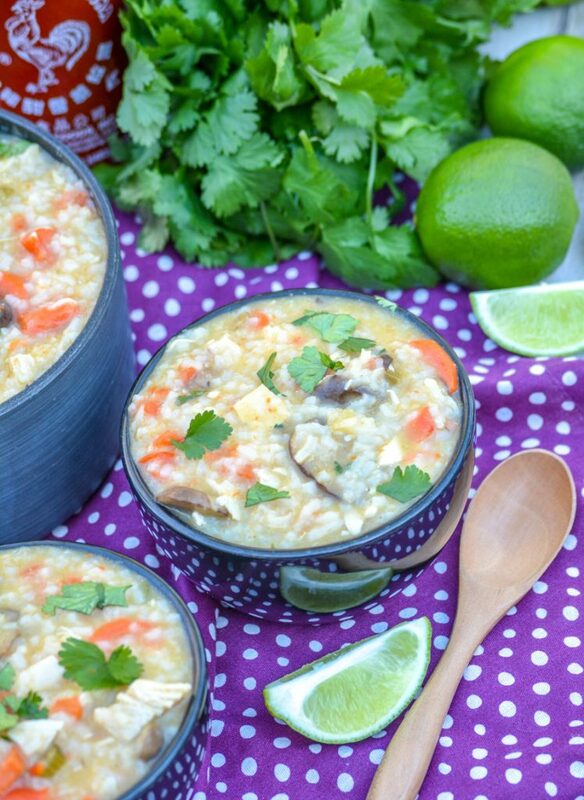 This is one of my new favorite summer soups! It has the perfect blend of light creaminess with the curry flavor I crave, without being too spicy. It’s nice & light, even when the temperature is rising out side. It’s also not as spicy as a traditional curried dish. It’s subtle, not overpowering or sweat producing- another plus. Really it is ideal to serve any season of the year. I am not a fan of coconut, and that’s honestly putting it mildly. 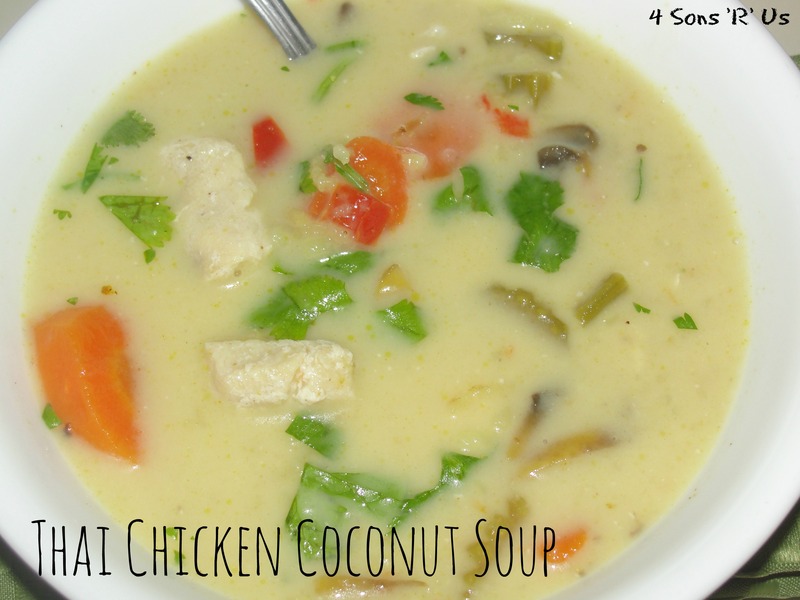 But this Thai Chicken Coconut Soup is one of the rare instances where there’s an exception to that rule. The vague hint of coconut isn’t at all overpowering. It’s not even the star here. In fact, it’s a downright compliment to all the other flavors. A little nod, adding a simple sweet creaminess that is there but unobtrusively hanging in the background. Add to that the other ingredients: chopped rotisserie chicken, fresh veggies, Thai curry paste, basmati rice, rich broth, fresh squeezed lime juice, chopped cilantro leaves, salt & a pinch of sugar to balance it all out. Nothing too complicated, a lot of things your probably already have on hand. All these yummy things blend together in a subtle menagerie in your soup pot, and are greedily enjoyed by the spoonful. Now let’s dig in, and talk about how we make this Asian-infused magic happen. 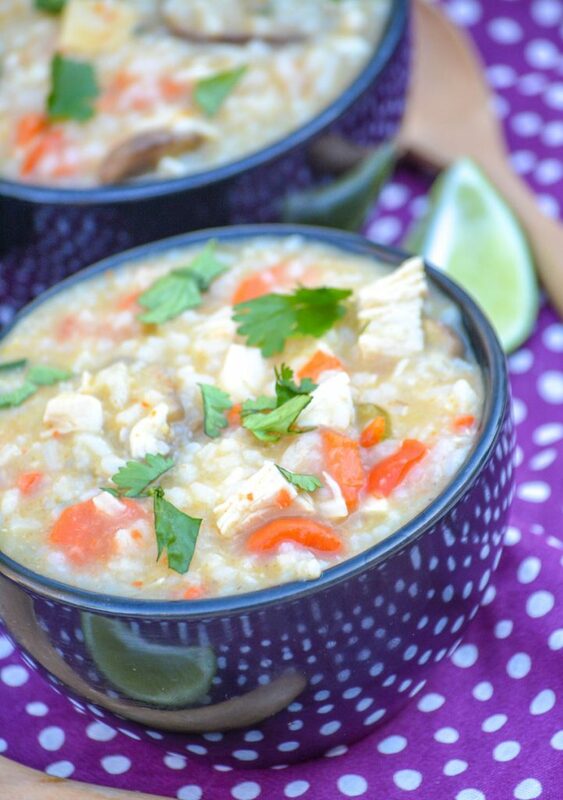 At the heart of this recipe really is just a basic creamy chicken and rice soup base. The ‘froof’ is what makes this soup so special. Start by heating a large Dutch oven over medium heat. Then add in a bit of coconut oil & Thai curry paste, stirring them together to combine. Here you have a bit of wiggle room. You need to use a prepared paste, and most stores sell both red & green. Either works, so just use your favorite. I tend to lean towards green because it’s a fair bit less spicy than the red version. All the veggies are then stirred into the pot. I use a mix of celery, carrots, red bell pepper, and sliced mushrooms. If you have other veggies on hand though, they can also be thrown into the soup pot. It may not be nearly as ‘authentic’ to Asian cuisine, but we’ve also thrown in green beans, shelled edamame, and even corn cut off the cob. Extra veggies have never hurt anybody, and waste not want not and all. Salt them, and let them saute for 8-10 minutes so they tenderize. Add the rice to the mixture, stirring it in. Let it saute for about a minute. Pour in the broth and bring the mix to a boil. Once it reaches a full boil, reduce the heat drastically so it’s only simmering. Stirring often to prevent sticking, cover the pot and let the soup simmer for 30 minutes. Add the remaining ingredients to the soup, stirring to evenly combine. 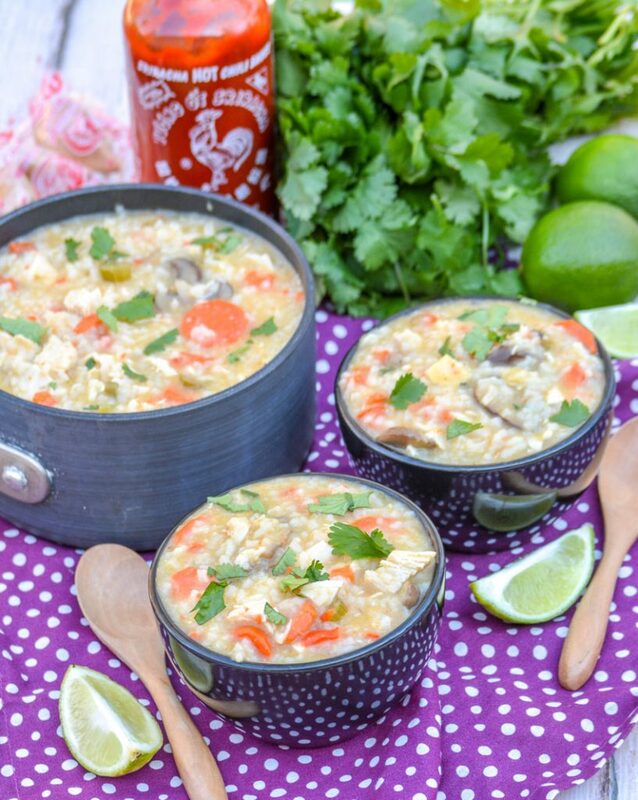 As soon as the Thai chicken coconut soups heated through, remove the pot from heat. Let it rest for 2-3 minutes. Don’t worry the Dutch oven will keep it piping hot. Taste and adjust the salt or sugar, if needed, to your preference. Ladle the soup into bowls and serve garnished with additional fresh cilantro leaves and/or a drizzle of Sriracha sauce. You can serve it as is, and it will be totally divine. The garnishes are good too, but 100% optional. This is my kind of ‘Thai’! While this may not appeal to an authentic Thai food enthusiast, it was everything I was looking for. 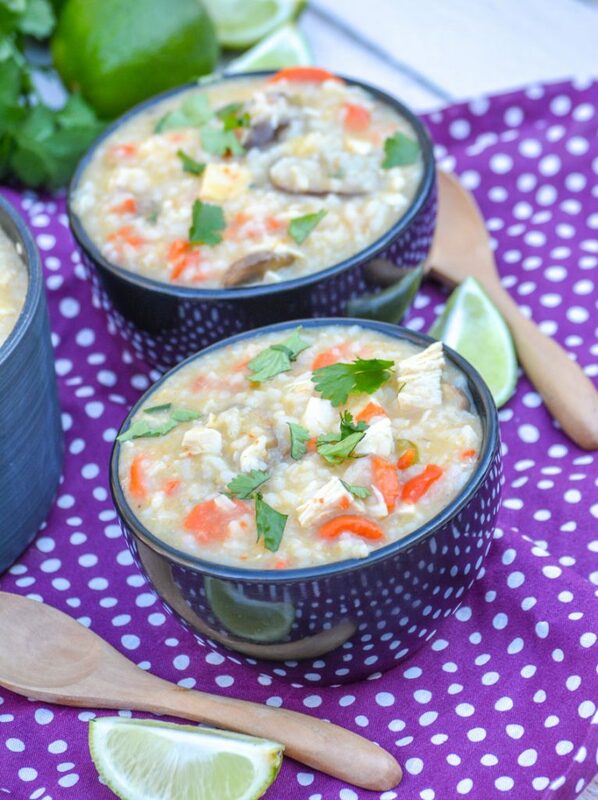 This Thai chicken coconut soup is perfect for someone who loves a good creamy chicken and rice soup and Asian flair. 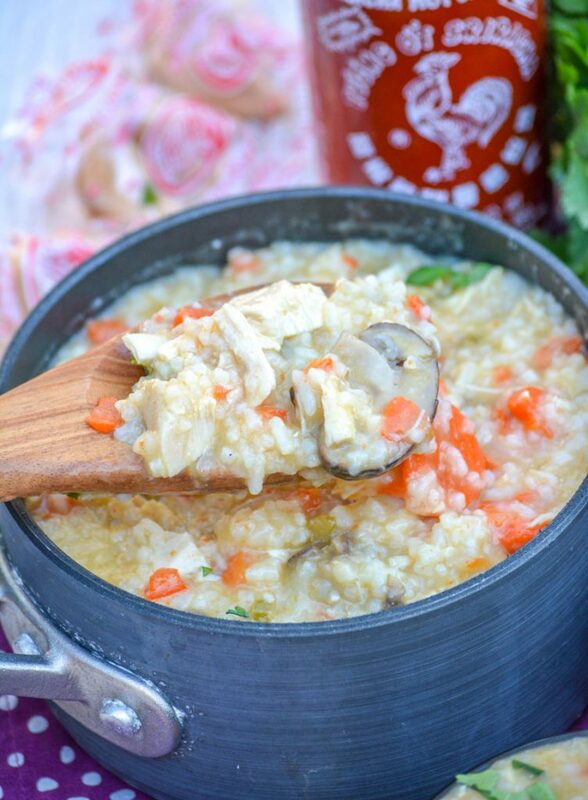 In a large soup pot, or dutch oven, melt the coconut oil over medium heat. Add the curry paste, stirring to combine evenly. Add all the vegetables and salt and saute for 8-10 minutes. Add the rice and cook, stirring constantly, for about 1 minute. Add stock, bring to a boil and reduce to a simmer. Simmer, covered for 30 minutes to allow rice to fully cook. Add the cooked chicken, coconut milk, lime juice, sugar and cilantro. Stir well and allow to heat through. Remove soup from heat, taste and adjust seasoning if necessary with more salt or sugar. Serve soup sprinkled with more fresh cilantro and a drizzle of Sriarcha sauce, if desired. So glad you liked it. Thanks for the credit! Oh wow!! What a tasty soup! I could dive into this!! Thanks for sharing at Fiesta Friday party!